The last couple of weeks, I've been busily trying to get my HTML coding skills up to par  been teaching myself Cascading Style Sheets, among other things. Like most folks who work in the computer industry, I've got stacks of books  HTML and DHTML, XML and CSS. They range from straight reference books to "teach yourself" types that walk you through the different steps of whatever it is you're presently trying to learn. But none of them are as good as what I've found for free on Lycos' Web Monkey site. Off the main page is a How-To menu  choices here include authoring, design, multimedia, programming and backend, among others. Each will take you to a series of lessons that will teach you through examples how to learn the skill you're after. And to be quite honest, Steve Mulder's Stylesheets Tutorial has been a godsend. Stuff I was stuck on and couldn't figure out from my stack of books was all right there in his lesson plan. The materials here are generally up to date, and new stuff is being added all the time. 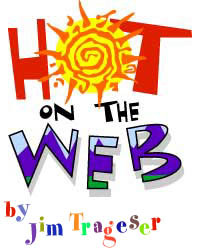 Another good site for getting help in improving your HTML skills is Netscape's Web Site Garage. Much of what is here is subscription-based, but there are some free services, at least on a trial basis. Among the offerings is a free site tuneup  their server will visit your designated page and help you improve its speed in loading, look for bad (i.e., nonconforming) HTML code, huge graphics, etc. Then you'll get a report via e-mail with suggestions on how to improve that page. They also have a GIF Lube to help you shrink your image file size without sacrificing image quality, and the Hitometer service to help you track the amount of traffic visiting your site. Unfortunately, they've shut down the Resource Center, which is where there was a lot of info like what Lycos' Web Monkey offers. Finding just the right color in HTML (or even for Cascading Style Sheets) can be a pain, especially if you want a shade that's not name-defined (i.e., blue, green, etc.) under HTML. Nobody can memorize all the Hex codes (#FFFFFF being white, for instance) for HTML colors. Fortunately, you don't have to memorize them  thanks to folks like Dave Stephens, who've posted pretty in-depth color charts on their web sites. Set up in a large, scrolling table, his color chart shows a sample for each color, and then gives you the Hexadecimal code for it  kind of like an online version of those paint sample sheets they have at the home improvement stores, so you can compare 38 different shades of off-white. The HYPE Color Specifier probably doesn't have quite as many individual colors as Dave Stephens' chart, but it does have a couple useful features the other doesn't. For starters, it includes both the RGB and the Hex value for each color  useful if you're creating graphics for a page and want the colors to match exactly the colors you're calling up in HTML. In addition, if you click on the color name in this chart, it opens a new document with the background set to that color  gives you a better feel for the color than a little swatch can ever do. What I've taken the liberty of doing is saving each of these color charts to my hard drive as an HTML document. The graphics links are broken, but the color charts remain  available to me even if these pages are no longer supported down the road.